Norma Jean Baker (1926-1962), otherwise known as Marilyn Monroe, American actress, singer, and model. After growing up in foster homes and an orphanage, Monroe dyed her hair blonde to pursue a career in acting. Her first starring role was in the film Niagara in 1946, and continued to build her fame with other films, such as Gentlemen Prefer Blondes, How To Marry a Millionaire, and The Seven Year Itch. 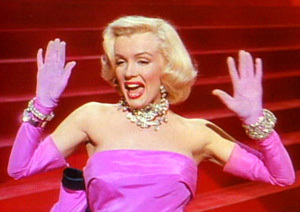 Although frequently portrayed as a ‘dumb blonde,’ Monroe discussed her ambition to play dramatic roles, and she pursued acting lessons to deepen her ability. Monroe was romantically linked to professional baseball player Joe DiMaggio, playwright Arthur Miller, as well as the Kennedy brothers, John and Bobby. Monroe had a family history of mental illness and institutionalization. She suffered from insomnia, and began taking sleeping medications to cope with her condition. She began seeing a psychiatrist regularly, who noted her complaints of insomnia. The psychiatrist also noted that she visited numerous doctors to receive prescription medications. He said that she was reaching the point of addiction, but that her drug abuse came and went. Monroe started drinking heavily, and in 1956 she was hospitalized for ten days. Details of her hospitalization were not disclosed. the uterus (endometrium) grows in other areas of the body. This often causes pain, irregular bleeding, and possible infertility. If you use a steroid inhaler like Advair for asthma or COPD, rinse, gargle and SPIT immediately after inhaling. Not rinsing heightens the risk of thrush, but swallowing the stuff puts steroids where they don't need to be. I used to follow my morning puff with a swig of coffee until my doctor put me straight! If you do get thrush (candida) a course of probiotics can help, as can eliminating sugar from your diet. If a plain water rinse doesn't work, try using mouthwash--either a commercial brand, or try putting a few drops of tea tree oil in the water, or use one part cider vinegar to two parts water.